Leatherman's mission was one that was crucial to morale, his captain explained. Loyd Leatherman was 18 years old when he first stepped aboard the U.S.S. Oglethorpe, the massive Navy cargo ship that would be his home for the next two years. It was 1944, the world was at war and Leatherman had just finished his training in San Francisco. He was preparing for life thousands of miles away in the Pacific when his captain approached him. “He said, ‘You’re going to be the first man over the side when we hit port and you’re going to be the last man to board when we leave. And that’s just the way it’s going to be,'" Leatherman, now 90, told ABC News. "He said, ‘I want you to understand, from my point of view, the mail is the most important thing on this ship,’” Leatherman said. “We delivered the good news, basically." (Janet Weinstein/ABC News) Loyd Leatherman, 90, served as a U.S. Navy mailman during World War II. He was stationed aboard the U.S.S. Oglethorpe in the Pacific Theater. Leatherman said that once the U.S.S. Oglethorpe set sail, the captain's words rang true: loaded down with about five bags of mail, he said he was the first person off the ship when it docked and the last person to board when it left port. He carried letters from soldiers to their loved ones at home to the port's post office, and picked up mail for sailors on his way back. Sometimes his journey included riding in the back of a jeep, other times he would have to trek by foot. He said he was almost always accompanied by armed escorts. “Every time I got back to the ship with all this mail, they could hardly wait for me to get it sorted and get it out to them,” Leatherman said. According to the Post Office Department's 1945 Annual Report, more than 56,000 postal personnel like Leatherman served in the U.S. armed forces during World War II. They worked, lived and died alongside the U.S. soldiers deployed across the world. Their mission was one that, while not always mentioned in history books, was crucial to the war effort. 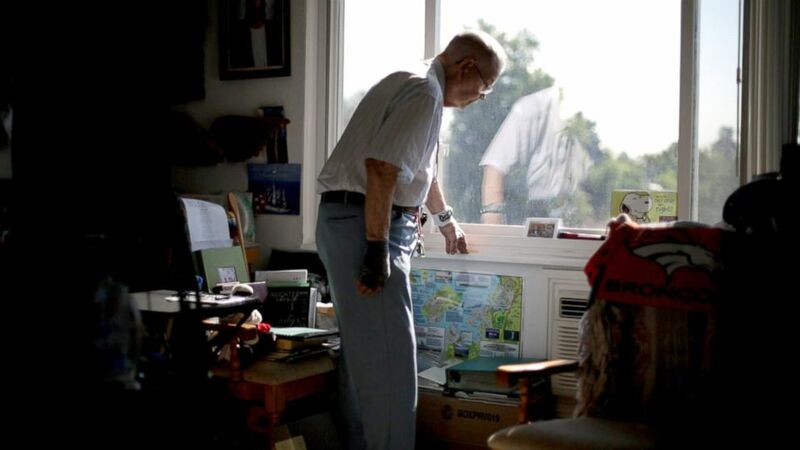 (Janet Weinstein/ABC News) PHOTO: Loyd Leatherman, 90, served as a mailman aboard the U.S.S. Oglethorpe during Word War II. He kept his uniform patch and many of the letters he had sent home while deployed. Mail was often the only lifeline troops stationed far away had to their loved ones back home, Leatherman said. "The physicality of the mail itself –- the smell, touch, handwriting –- were reminders of people and relationships, while the sentiments and ideas expressed were reminders of values and priorities in life," Lynn Heidelbaugh, a curator at the Smithsonian's National Postal Museum, told ABC News. "Mail had the power to shape morale by providing a connection to oneself, to people one valued, and to one’s community," Heidelbaugh added. Leatherman said he delivered many magazines to troops stationed around the Pacific Theater. 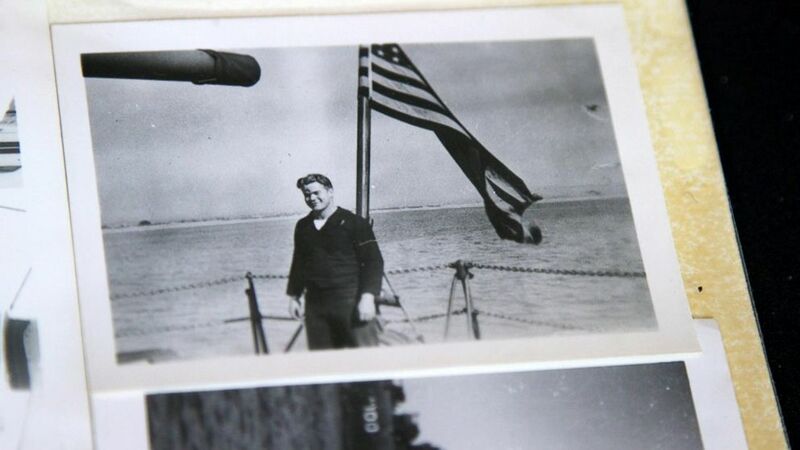 He also remembers picking up money orders bound for their families back in the U.S.
(Janet Weinstein/ABC News) A photo of Loyd Leatherman taken aboard the U.S.S. Oglethorpe during World War II. Most of the pieces of mail he handled, however, were handwritten letters to loved ones at home. “Dear folks, today I received two letters from you and I was mighty pleased to get them,” Leatherman himself wrote to his parents in 1946. He still has that letter in his home. Leatherman was assigned to the ship after the war ended for wrap-up efforts, he said. “After we get all unloaded, we’re supposed to be available for troops and cargo on the return trip. I figure it will take four months, so I should be eligible for discharge when I’m back,” he wrote to his parents at the time. 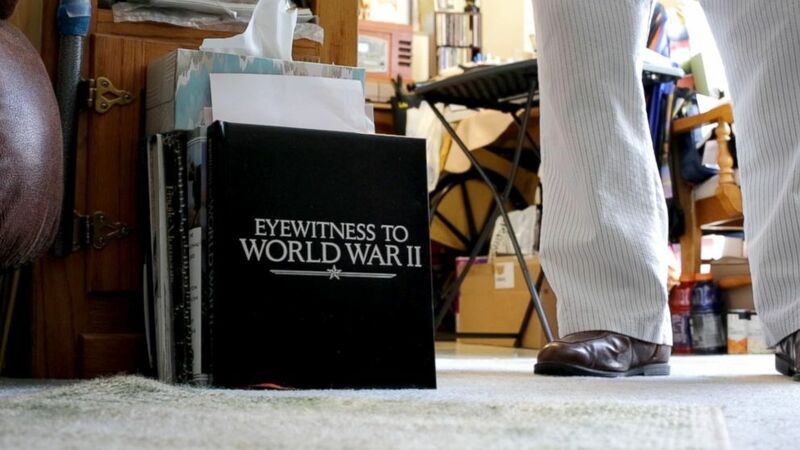 (Janet Weinstein/ABC News) Leatherman stands next to a book on the ground of his apartment that is entitled "Witnesses of World War II". 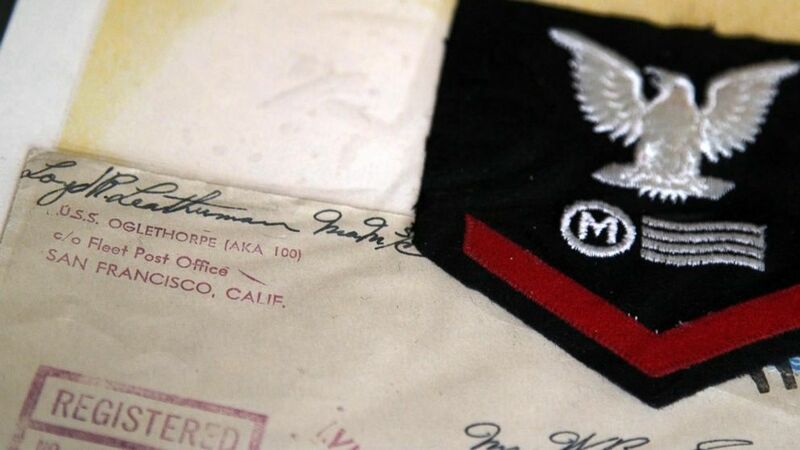 Leatherman was a mailman aboard the U.S.S. Oglethorpe in the Pacific Theater. Though as a mailman he never fought in battle, Leatherman said there were times that the job could be dangerous. As he was walking on the main deck of the ship with a friend, he said a Japanese spy plane flew out from behind the clouds and shot and killed the man right beside him. “He got a bullet in his heart and his heart exploded. He was dead before he hit the deck. And I never got a scratch,” Leatherman said. (Janet Weinstein/ABC News) Loyd Leatherman looks out the window of his small apartment in Denver, Colorado. He is a Navy veteran and served as the mailman aboard the USS Oglethorpe. Today, Leatherman lives in a small apartment in Denver, Colorado. He said he was married once, to a woman named Betty, for more than 25 years. She died in 1978 of a heart attack. They had two kids, both grown now, and he never remarried. 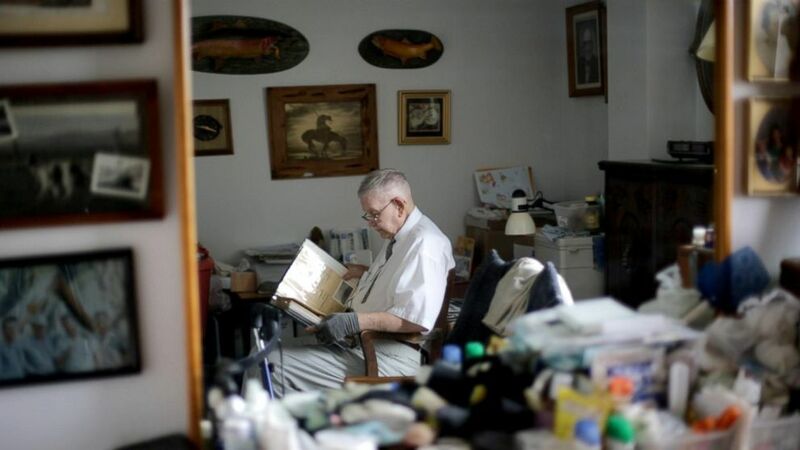 Surrounding him in his cluttered back room are scrapbooks and photo albums from his near-century-long life. One book has a dozen or so pictures that he took aboard the U.S.S. Oglethorpe. The book also contains some of the letters he wrote to his parents while at sea and the original arm patch he wore on his uniform. It’s been more than 70 years since Leatherman was aboard the U.S.S. Oglethorpe, but “I couldn’t have asked for a better duty,” he said of his time there. Leatherman said he tried to get involved in the postal service when he was discharged, but his small town of Rand, Colorado, wasn’t hiring at the time. He said he ended up getting involved in a family friend's business selling jewelry. While he loved his job, he said he missed delivering the mail. When asked if he could ever foresee something like World War II happening again, Leatherman grew solemn. Editor's note: an earlier version of this story mistakenly used an incorrect photo of Loyd Leatherman. That photo has been replaced.